Is there any value to the coefficient points now though? No. Only moral + 'I told you so'. As reported by GdS, the reform of the Championship League is likely to remain a mirage. At a meeting today in Zurich, the Espfl expressed total disapproval of the recent reform of UEFA which will allow the first 4 teams of 4 leagues with the best rankings, to access directly to the group stages. According to the alloys, in fact, it runs the risk of having a closed tournament and why they threaten to organize league at the same times of the Champions League, in order to boycott it. The European Professional Football Leagues (EPFL) umbrella organisation has today (Friday) stepped up its campaign against Uefa’s reforms for the Champions League by announcing it will break an agreement that currently prevents European and domestic games from clashing. Following a meeting in Zurich today, EPFL chairman Lars-Christer Olsson said the body had been left with “no option but to end the memorandum of understanding” after voicing its concerns consistently since the changes were announced in August. At present, domestic leagues avoid scheduling matches on days which Uefa has allocated to European competition. The EPFL said that this will now end in March 2017. The reform measures unveiled by European football’s governing body for the Champions League and Europa League will see the continent’s top four leagues granted automatic qualification for four teams each to its elite competition. The amendments are set to take hold from the 2018-19 season and will work across the 2018-21 cycle of Uefa’s club competitions. Under the changes, the top four clubs from the four top-ranked national associations will now qualify automatically for the group stage of the Champions League. The automatic qualification would benefit the top four leagues in the Uefa coefficient ranking, currently the Spanish LaLiga, German Bundesliga, English Premier League and Italian Serie A. This means places for the winners of the 11th and 12th ranked leagues will be cut and the number of places reserved for teams from the remaining leagues, who compete in an initial qualifying competition, will be reduced from five to four. The proposed changes have proved controversial, with the EPFL, which represents 24 European domestic leagues, having previously voiced their opposition, including the threat of staging games to clash with European matches. Today’s decision to end the MoU was reportedly only opposed by Serie A.
Juve, Napoli, Roma, Fiore will qualify to next stages, Inter are out, Sassuolo very hard. Clubs from lesser European countries are undergoing discussions over a breakaway European league involving teams from Scotland, Denmark, the Netherlands, Belgium, Norway, and Sweden to combat the potential freezing out by the new reforms introduced in the Champions League. FC Copenhagen director, Anders Horsholt, has revealed discussions have been going on over the formation of a new league to rival the Champions League, which has taken a road to make it more exclusive to the continent’s biggest clubs. “We must therefore look at which alternative international opportunities for FC Copenhagen in the future,” said Horsholt in an interview with Danish newspaper BT. The new reforms to be introduced in the Champions League include the change that will allow the top four clubs from the four top-ranked national associations to qualify directly for the group stage of the competition. Spain, Germany, England, and Italy are the current incumbents of the top four spots in Uefa’s country coefficients, which would mean there will only be 16 spots for clubs of the remaining 50 countries to fill. Horsholt further stated that, although any specific model for a breakaway league is yet to be drawn up, clubs the size of the Danish champions are looking into that prospect. He added that the gap between the biggest clubs and clubs like Copenhagen can be bridged only by playing in a separate league at the European level. Here it is still too early to talk about specific models, but the discussion of leagues across European borders is a theme that we look at and actively participate in. We understand that the biggest clubs act as they do. But it also means that we must look at the market it leaves and seek alliances with teams from other countries in the same situation. This is not a situation that we have created, but we have to deal with it because we cannot live with the alternative accounting. We must continue to develop as a club and be attractive to sponsors, the most skilled players and staff. Therefore, it is essential that we are at the European level. FC Copenhagen and other European clubs that will be part of a new European league will step out of their domestic leagues. It is still well in the future, but it may well be the result. Copenhagen are second in their Champions League group which also contains Premier League champions Leicester City, Portuguese giants FC Porto, and Belgian champions Club Brugge. Celtic’s chief executive, Peter Lawell, was, in February, reported to be in favour of a breakaway league as he feared for the Hoops’ fate in the Champions League with the new reforms. Horsholt had also previously expressed his desire to form a Champions League for the smaller European countries in 2014, and if the ongoing talks come to fruition, he might just realise his dream of a European competition where Copenhagen could challenge for the title. Last edited by Jasper; 25-11-2016 at 16:28. But first, Italy, the biggest winners in this new shake-up. The basics you already know. 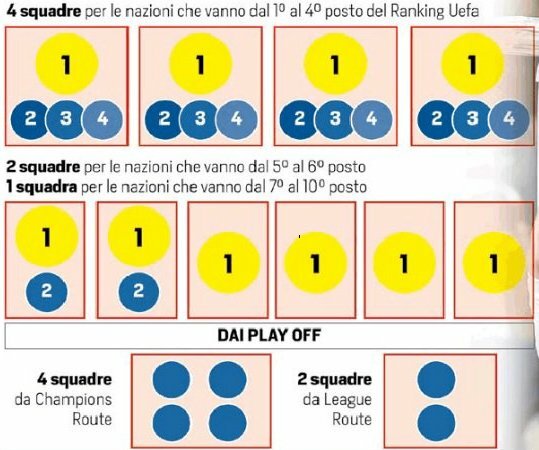 Serie A will soon have four teams, guaranteed, in the Champions League group stage, despite a quite disastrous record in the play-offs. As of now, Italy get three teams into the tournament, except in six of the last seven seasons an Italian entrant has fallen in the preliminary elimination rounds. Yet the rich kids of Serie A, the underachieving Milan clubs first among them, have made enough threats of a European breakaway in recent months to rattle rudderless UEFA. So, from the season after next, half of the group stage places will be split between four countries: Spain, England and Germany — whose clubs tend to make the necessary progress through the play-offs — plus over-rated Italy. A country that can barely merit three teams at elite level will now be entitled to one more, and no play-off required. Yet, as with much of what UEFA do, the devil is in the details. And what details they are. On page 11 of the UEFA document announcing the new cycle, the extent of Italy's gain can be found; or, to be precise, the extent of the gain for one club: AC Milan. That Giorgio Marchetti, UEFA's director of club competitions, should be one of the prime movers in the reorganisation of the Champions League co-efficients is no doubt purely coincidental. Marchetti was born in Luino, north of Milan, was educated in Milan, and supports Milan. Not that he will have let that cloud his thinking when plotting this new course — or allowed Milan's enormous self-regard to skew the competition in their favour. Finally, the current UEFA director of competitions Giorgio Marchetti was appointed UEFA Deputy General Secretary. The new Champions League has been approved. Serie A will have 4 teams starting from 2018. "if we have another year like 14/15 ..."
could bundes bottle enough to take them over and restore Serie A golry as top 3 league? Why does this matter when Serie A has 4 CL spots? Co-eff logic is irrational; only about chest-thumping. I think there's a fair chance Bundes will bottle it this year - Milan and Lazio in Europa League will be key to Serie A re-claiming the spot. ^Good point. 15/16 and 16/17 coefficient points are identical for Serie A and Ligue 1 with Bundes and EPL a little ahead. If Ligue 1 continue this way, there will be a 4-league fight for 3 spots by the 2019/20 season. Cause people thought it's doable.